About Pearlscale Goldfish – 5 basic characteristics & 4 care tips | My Goldfish Is Alive! Fancy goldfish have been bred for centuries to achieve certain looks and characteristics. 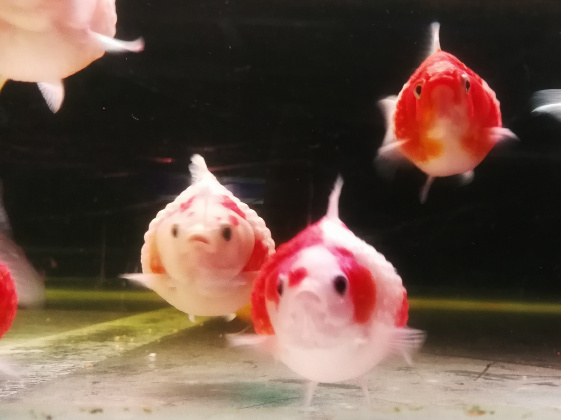 We have the Telescope goldfish with those big eyes, the Orandas with pronounced head growth, the Ranchus with the rounded back and no dorsal fin, the Ryukins with high backs and small heads, and many more. 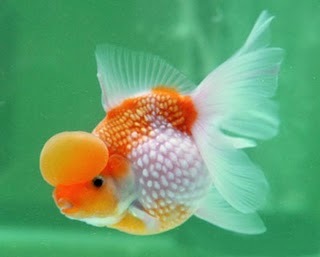 Today we are going to talk about Pearlscale goldfish, the breed that appeared cute to some, but hideous to others. As per its name, the Pearlscale goldfish breed’s main specialty is on its scales. 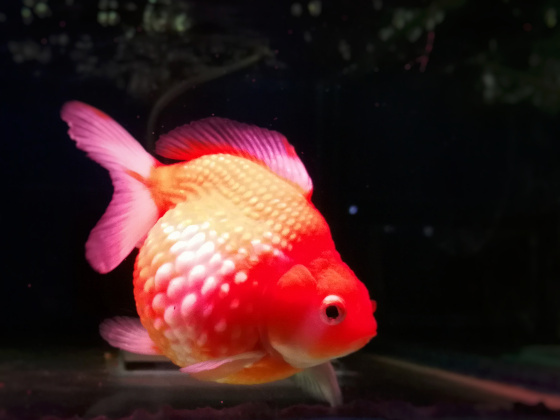 Unlike other goldfish breeds where the scales grow in an overlapping pattern like the shingles on a roof, Pearlscale goldfish’s scales are dome-shaped. As with most of the fancy goldfish breeds, Pearlscale has a rounded body too. However what sets it apart from other rounded bodied breeds is that the depth of a Pearlscale’s body is around two-third of its body length, making it almost round like a ball. Together with its dome-shaped scales, a Pearlscale goldfish’s body does look very much like a golf ball. This ball-like figure may look extremely cute especially when coupled with its slow and wobbly swimming style, but it causes its internal organs to cramp up in a small body cavity as it grows, making it susceptible to disorders such as the swim bladder disease. Pearlscale goldfish can be found with different variations on the head. Its head can be with or without head growth. 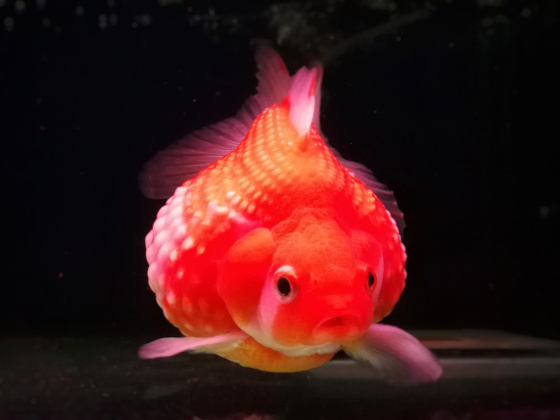 For those with head growths, the head growth can be similar to those found on Oranda goldfish or a special kind called bubble domes. These bubble domes Pearlscales are very sought after by goldfish enthusiasts. This breed can come in short or long fins. They all have a single dorsal fin while the other fins are paired. Pearlscale goldfish come in many varieties of colors. They can be found in red, white, blue, black, calico or red/white combinations. As with any goldfish, Pearlscales can grow rather large when taken care of properly. As a rounded bodied fancy goldfish, this breed can grow at least 6″ in body length. So they need a big space to thrive and to grow. The recommended stocking is at least 20 gallons for the first Pearlscale and a minimum of 10 gallons each for subsequent ones. All goldfish need good water quality to thrive. Due to their sloppy nature in eating and pooping, the water quality can easily deteriorate if the fish tank is not properly cycled and regularly maintained. So always make sure your fish tank is cycled, do regular water tests to know the level of water quality and regular water changes. As they are prone to swim bladder disease, you should be careful not to overfeed them. Feed small amount of food which they can finish eating in a few minutes (I would say around 3 minutes). If there is leftover food, do scoop them out. Feed them a variety of food so that they can get the nutrients that they need. Check out this post on a high-quality dry fish food that I highly recommend. As the Pearlscales are slow swimmers, they will not be able to compete for food if they are kept with much faster fish. So choose their tank mates wisely. They are best to be kept with their own breed, or with other slow swimming goldfish breeds. 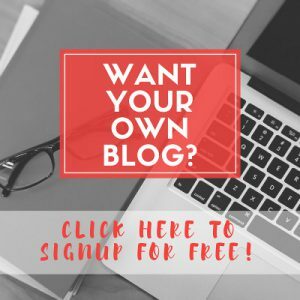 So that is all I have about Pearlscale goldfish – the 5 basic characteristics and 4 tips on caring for them. Cool. I really never thought of pairing fish with others based on swim rates but it makes so much sense. Thanks for that information. Hopefully my next set of fish will have a longer life! Thanks for your comment. Compatibility when keeping different types of fish is really important. If these goldfish are kept together with incompatible fishes, they will end up being underfed, stressed and battered. These will of course, cause sickness and death.